So, where is Meigor, where Alexander’s uncle acquired title to land? And where is Craigneich, where we believe Alexander was raised by McGruder relatives after the death of his father? There are several interactive maps of Glen Artney on line, but they show only sites and landmarks likely to interest an average tourist or hiker. You’ll have better luck with the online maps at Gazetteer for Scotland, on which you can find most McGruder sites–though it helps if you know where to look. To that end, here is a snapshot of part of the paper version of Ordnance Survey Explorer Map #368: Crieff, Comrie, & Glen Artney (which you can purchase here). I have circled Meigor and Craigneich, so you can see where they lie in relation to Comrie. I’ve also included the grid references at the right edge. I hope you can use this to correlate with the online maps. (The area marked off in red, at the bottom of the photo, is a military reserve, BTW.) Blairmore (formerly Blairinroar), a bit farther up Glen Artney, also has McGruder associations. What I missed circling on this map is Trian House (Treyanmanich or Treyanmianuach, also known as the middle third of the lands at Meigor) which lies in the wooded area between Easter Meigor and Lower Meigor. Directly north of Trian was Milntuim, not marked on this map. At Milntuim were a lint mill and a corn mill, referred to in records from the 18th c.
To reach Glen Artney from Comrie, turn south on the Braco Road, clearly signposted at the turn. (You’ll pass the post office and public restrooms on the way out of town.) You can stay on that road (B827) all the way to the main Glen Artney road (where, yes, there is still a public phone box!). As you see on the map, that road will take you right up the glen, past Easter Meigor, Trian House, and Wester Meigor. Lower Meigor is reached on the road that intersects near Wester Meigor and comes out on B827 at Cultybraggan. There’s an old graveyard at Cultybraggan, but you’ll have to ask locally how to find it–you go right in through a farmyard. The last of the McGrouther family of Meigor were buried there, and the table-like marble slab is their memorial. See a description (and transcription) in both John MacGregor and Duncan McGruther’s writing. Most of the road up Glen Artney is high above the river, the Water of Ruchill. Views are tremendous, but a hike down to the river would be slick and difficult. If you keep driving up past Wester Meigor, you can reach the one place in the glen where it’s possible to park and walk by the river. Look for the church parking lot right by the road, on the right hand side. 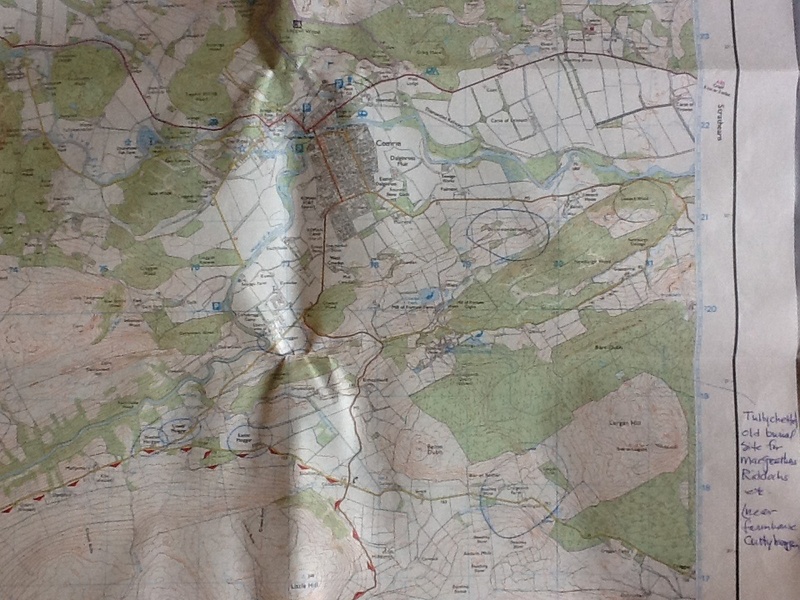 (It’s marked with a big blue P on the Ordnance Survey map.) The church is to the left of the road, up a flight of steps, but access to the river is flat and easy. You’ll see on the map, that to reach Craigneich all you need to do is turn the other way at that phone box along the B827. The map I used is two-sided and this snapshot is from the westerly portion. To the east of this area (and on the other side of the map) lies Belliclone Farm, where Alexander was born (in Madderty Parish), along with Innerpeffray, Inchaffray, Drummond Castle, Cargill, and other sites associated with the Magruders and their Drummond connections. I tried to snap a shot of them, but the area is too spread out. My Belliclone & Inchaffray page has directions, plus a map snapshot showing the immediate area around those two sites. For Drummond Castle and Innerpeffray Library, you can get directions from their web pages. Innerpeffray Library & Chapel lie about midway between Belliclone and Drummond Castle. See The McGruther/Magruder Heartland for more info on those sites. If you visit Drummond Castle Gardens first, and then want to find Craigneich and Glen Artney, just go out the back way from the castle and turn left, then turn right on the road to Culloch. You’ll see on my map snapshot, that Culloch is just west of Craigneich, and it’s not far. Thanks to Don McGruther & Hugh Rose, both of whom generously showed me around the McGruther country on my most recent visit. I learned a lot from both of you!